Salt Fork Images: Lesson #6 ..... The Last Tradeoff Lesson! Lesson #6 ..... The Last Tradeoff Lesson! Lesson #4 was about the tradeoffs involved with choosing an ISO. Lesson #5 was about the tradeoffs involving aperture choices. This one is about shutterspeed. If your shutterspeed is too slow, then your photos might be blurry because your camera was shaking or because your subject moved. Sometimes blurry is very cool. That's why we need to understand how shutterspeed works! Shutterspeeds on digital SLR cameras may range from 1/8000th of a second up to 30 seconds. Which speed you choose out of that range depends on what you are trying to accomplish. If you are trying to photograph a 98 mile-per-hour fastball right as it leaves the pitcher's hand, you better use that 1/8000th of a second shutterspeed and you better hope that no one notices that the ball is still a little blurry. That's because in 1/8000th of a second, the ball traveled 0.21 inches. Bummer! The good news, though is that you don't have to worry about camera shake when you are shooting 1/8000th of a second shutterspeeds because it is unlikely that you are shaking at 98 mph! Maybe you want to shoot a nice dreamy waterfall and you want to blur the water. How fast is the water going? Maybe 5mph? If it's going 5 mph, then it travels 7.33 feet in one second. If your shutter speed is set to one-half second, then the water will travel 3.67 feet while your shutter is open. It will definitely be blurry. And, if you don't use a tripod to hold the camera still, the rocks and trees and everything else around the waterfall will be blurry too! Here are some good guidelines to remember: If you are shooting sports, 1/500th of a second is good but 1/1000th is much better. If you want a milky-looking waterfall, 1/4th of a second is good but 2 seconds is even better. If you want to avoid camera shake, use a shutterspeed that is roughly equal to the focal length of your lens. For example, if you are shooting with a 200 mm lens, try to keep your shutterspeeds faster than 1/200th of a second to avoid blurriness due to camera shake. That's a mountain stream in Teton Canyon in Wyoming in May of 2007. I shot with ISO at 100, f/stop at 8, and shutterspeed at 1/4 of a second. 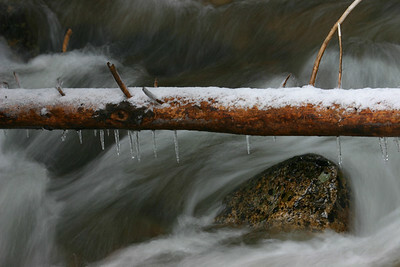 As you can see, the water is nicely blurred all around the log and the rock. And to keep the log and the rock sharp, I rested the camera on the window of my truck after turning off the engine. You don't always have to have a tripod, just something really steady on which to brace your camera. 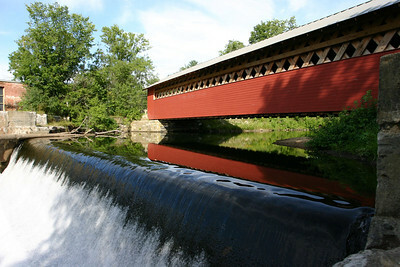 This shot is from Bennington, Vermont, and was taken during the summer of 2006. I used ISO 200, f/stop 7.1, and a shutterspeed of 1/400th of a second. The fast shutterspeed stopped most of the motion of the waterfall and it made it easy to handhold the camera. 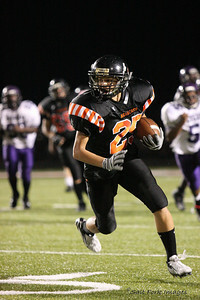 My young friend, Greg, catches the ball and heads straight toward my position on the sideline. What a catch and what a photo! I had the ISO at 3200 (max), the f/stop at 2.8 (max) and my shutterspeed was 1/500th of a second. Any slower than that and the shot would have been blurred. My daughter, Sara, plays a little soccer at 1/400th of a second. Again, f/2.8 and ISO 3200 - both maxed out - and the best I could get under the lousy stadium lighting was 1/400th of a second. 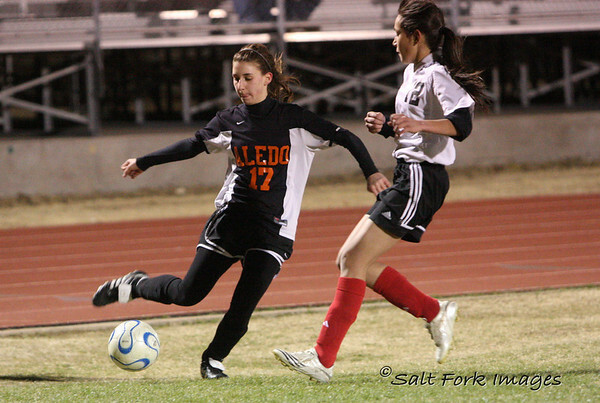 Notice how her foot is slightly blurred as it heads for the soccer ball. Maybe the shutterspeed was too slow or maybe it was her awesome power.... hmmm. And we'll wrap it up with an appearance of the marching band! This is a very cool shot that I actually did on purpose. This shot was at ISO 1600, f/20, and 1/15th of a second. I had been shooting with the high ISO and the camera set in Aperture Priority Mode when I saw this cool opportunity develop. With a flick of my index finger, I switched from f/2.8 to f/20 which caused the shutterspeed to drop down to 1/15th of a second. I took a couple of shots and immediately rolled the selector back to f/2.8 to continue. When I got home that night and reviewed my shots, I had a keeper! 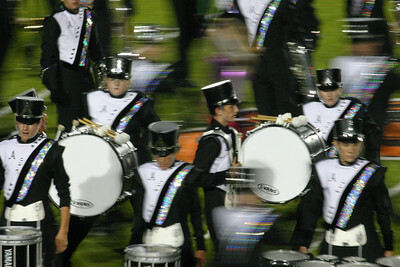 The blurred motion of the drumline with elements going in all directions really looks cool.... at least to me. Know how your camera works. Know how to control the shutterspeed and you can get the effects you want. Keep watching.... there's more to come! I Took My Own Advice! Lesson #7 - Get out there and Shoot!